Well, the Buff Orps averaged only 2.3 pounds each. Some got up to nearly 3 lbs, but that’s pretty disappointing after nearly 12 weeks. Looks like neither White Rock nor Buff Orpingtons will be the broiler to provide an alternative to the Cornish X for us. Next spring we’ll try Delawares (the broiler of choice pre-Cornish X) and some red broilers that several hatcheries are producing now and see if either of them can grow reasonably well. If not, then we may be forced to raise Cornish X until somebody is able to develop an alternative that can grow at a reasonable rate and still make better use of forage than the Cornish X do. The turkeys got to around 9 lbs each, which isn’t too bad considering that we weren’t able to get them until July. 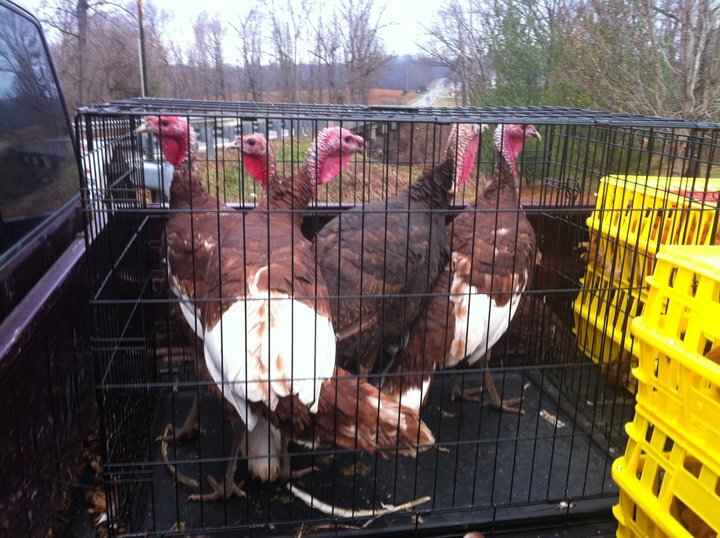 Next year we can start them in April or May and they should get to regular turkey size pretty easily. Those are nice looking turkeys! We used to have broad-breasted bronzes roaming around the farm when I was a kid (which were delicious), but I’ve never tried the heritage breeds.